Credit card fraud is an ongoing problem in the U.S. According to recent research, 47% of the world’s card fraud happens in the U.S. Knowing this, along with having some bad experiences, I decided to take extra precautions. Here’s a tip I learned and has since helped me fight back against fraud multiple times and win. When my credit card statements arrived each month, I would quickly scan through to see if there were any errors. 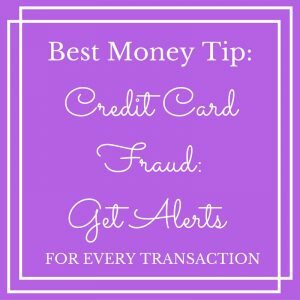 If I spotted a mistake or what looked like a fraudulent transaction, I would notify the credit card company as soon as I saw it. While mistakes could often get fixed with a phone call, I still had to take time out of my day to handle these types of situations. Depending on how close I was to having to pay my credit card bill, I would often have to pay the balance and then get credited which was very inconvenient. 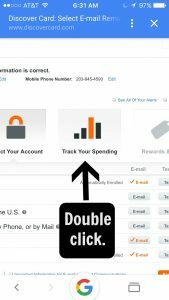 After reading a post called Why I Get Transaction Notifications for Amounts Greater than Zero by Jim Wang, this immediately changed how I handled checking charges on my credit card. I no longer had to wait and see what happened or constantly remember to check my transactions online. I could be alerted every time I used my credit card by using the suggestions stated in that blog post. Basically, if you set up text alerts to come to your phone or other mobile device, you can be notified of every transaction that occurs shortly after you make one. You can spot potential errors or see if someone else is using your credit card. I show you how to set up an alert. 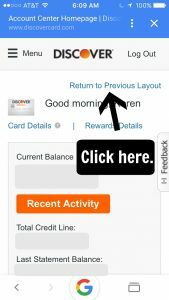 This example is for the Discover card, but the tip can be used for almost any card as long as they allow you to set the alert to a penny (or like Jim, any amount greater than zero). Some cards might not allow it. You have to check. Log in to your credit card account online. If you are setting this up via mobile device, you can either hit “return to previous layout” at the top right. 3. Then click “Manage” from the menu bar or you can start by clicking the menu icon in the top left and then scroll down to where it reads “Features and Benefits”. Click on that. Then choose “Security Center.” You can then click on the “Manage” in the menu at the top. 7. 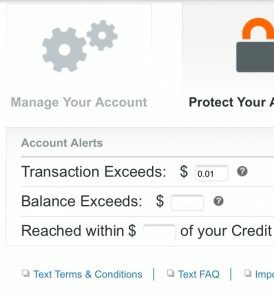 You can then fill out an account alert in order to be notified of any transactions. The trick is to type in a low amount like the Wallet Hack blog suggested. I put one cent. So if one cent or more is charged to my account, I get notified by the method I chose. I prefer text message. 8. You then choose if you want to be updated via email or text. Once you fill out the remaining, hit the orange button marked “Save”. If you opted for the text alerts, it will explain how your mobile number has been saved and gives you the option to send a test text alert to your mobile device. This came in very handy this past summer when I was overcharged for a hotel stay. There were also additional charges made by the hotel on my account. I called my credit card company. They wanted me to contact the hotel first. I was able to contact the hotel right away. They took one of the charges off. It was for roughly $16.00. They didn’t adjust the hotel stay to the proper amount even though I explained how I was overcharged. I called the hotel several times after letting them know the first time and got dropped into their voicemail each time after the initial call. The amount on my credit card receipt (and the receipt that I saved from the hotel) showed that I was being charged one amount, but the actual amount that they charged to the credit card was for more money. It was roughly a $30 discrepancy. I did have to wait until the transaction posted to the account. I then had to go to “Dispute a transaction” on Discover’s website. I took a photo of my receipt and uploaded it right on Discover’s site. You can find it through the help center on their website. You could also call and say you need to dispute a transaction. While it wasn’t fun to fill out a dispute right after my wonderful trip, I was happy that I caught it right away. I readily had the receipts handy and could stop the whole thing dead in it’s tracks and get my money back. 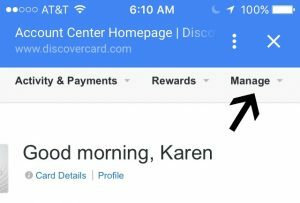 Discover took care of things nicely. I might not have noticed it if I had waited for my statement. If there was an extra charge, I might have thought it was for parking or something else. The details wouldn’t have been fresh in my mind like they were when I was alerted right away. In my experience, I believe it’s harder to dispute something if a lot of time has past. 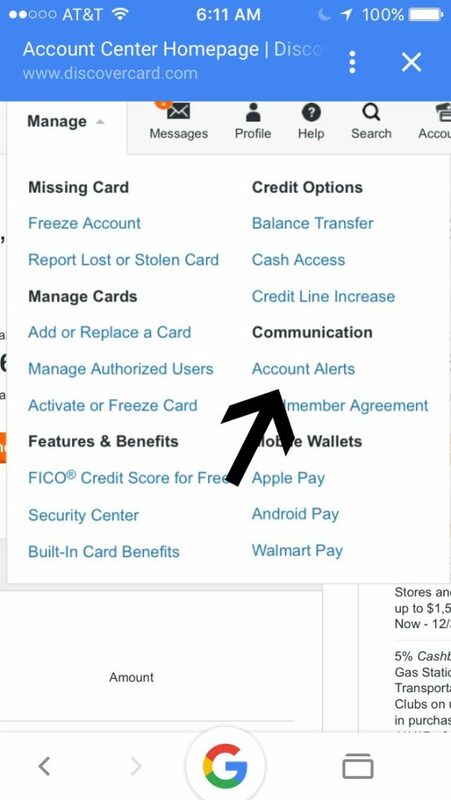 Consider signing up for these types of alerts on your credit cards. 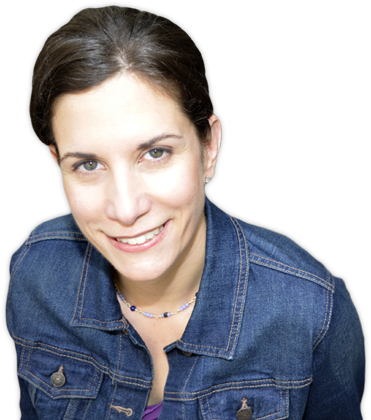 This one tip can be a big money saver. While we try to control our own spending, we definitely want to avoid having others spending our money fraudulently as well. This tip alone saved me $46 dollars that I might not have noticed. Maybe it can do the same for you.